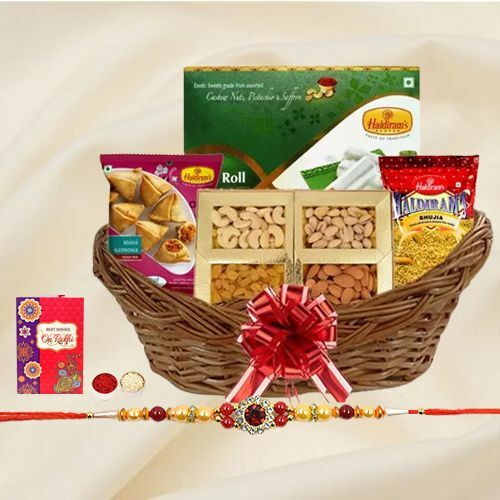 Elegance will be spread this Raksha Bandhan if you send this Smashing Rakhi Treat Basket of Love and Happiness to your dear ones which comes with a free Rakhi, Roli Tilak and Chawal. This Basket comes with Assorted Dry Fruits (200 gms), Haldiram Kaju Roll (200 gms), Haldiram Bhujiya (200 gms), Haldiram Mini Samosa (200 gms). There might be a slight change in the displayed design of Basket.